Between 30-60% of implanted prosthesis and manufactured in ultra-high molecular weight polyethylene fail at 10 years because the small particles released by wear and tear generate osteolysis. The main manufacturers of prostheses have replaced this material with materials that have greater resistance to wear. However, some of them have shown a low resistance to fatigue after long implantation times. 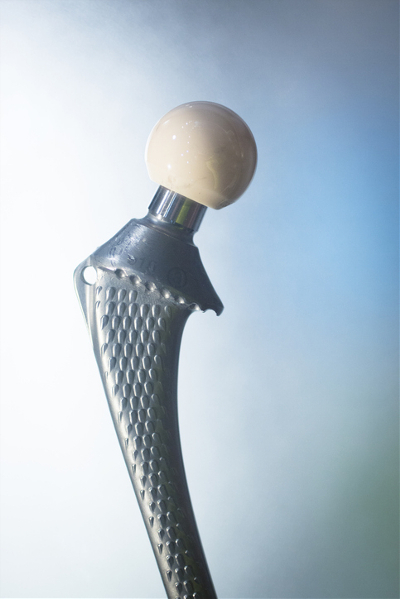 Today, polyethylene remains the gold standard for prostheses manufacturers, who continue to seek to optimize wear resistance and oxidation without losing resistance to fatigue. By mimicking the surface of natural joints, CIDETEC has developed a technology that keeps the surface of the friction torque of the prosthesis permanently lubricated and hydrated. The coating is highly biocompatible and does not alter the synovial fluid or the natural lubricants, thus avoiding the non-specific adsorption of proteins. This type of coating has been tested on a test bench during five million cycles and the wear rate of polyethylene has been reduced by up to 80% in comparison to uncoated material. This technology has been recently patented and its commercial exploitation is currently being worked on.